Italian design duo Formafantasma's Wire Ring lamp, unveiled at Milan design week, has a flattened power cord that forms a sculptural support for the light. The lamp is one of a pair of new lights released through the studio's first collaboration with lighting brand Flos. It features a central LED ring, which attaches to the wall.Formafantasma reinterpreted the power cable to be a feature, rather than something to hide away. The studio flattened it to resemble a belt, and stretched it across the top of the light to anchor it to the wall. The entire lamp can be disassembled to just a couple of pieces, and is available in pink, grey or white. 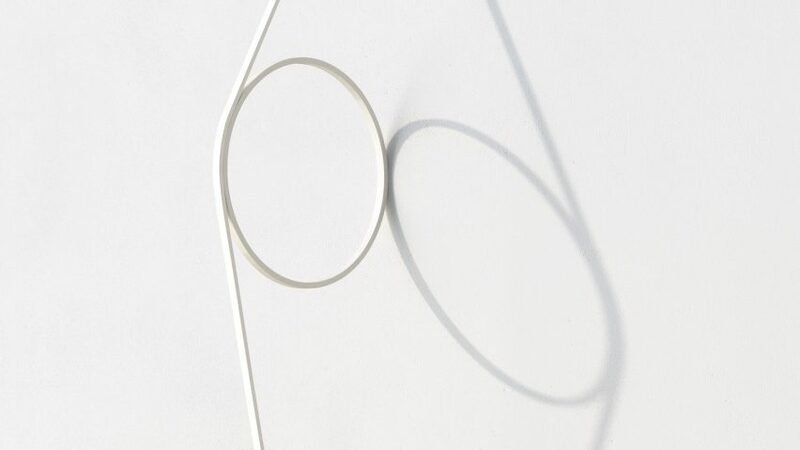 "Wire Ring is an exercise in reduction: stripped back to its most essential components, the lamp delivers the most with the least," said the studio, which was set up in 2009 after founders Andrea Trimarchi and Simone Farresin graduated from a masters at Design Academy Eindhoven. Formafantasma's second light for Flos is the Blush lamp, which casts multicoloured reflections designed to recall the feeling of long summer days. Intended to help combat the lack of colour during winter months, it uses an LED strip and piece of dichroic glass to create coloured gradient effects on nearby walls. "The relationship humans have with light transcends a functional dimension and is elevated to an emotional one," said the studio, which has also designed furniture made with lava and cow bladder lights. "Lamps are designed to illuminate the world with brightness, but also with the intimacy of shadow: the quality of light cannot be measured through its intensity," the pair added. The Blush lamp is similar to pieces exhibited by the studio at a solo exhibition in 2016, which also included lights that generated coloured reflections. The lamp is available in several finishes, and there are also different colour combinations on offer. Both pieces will be on display at lighting fair Euroluce during Milan design week, from 4 to 9 April. The studio is also showing an exhibition of lighting design at Spazio Krizia, Via Daniele Manin 21, which includes golden hoops that project circles of light. Canadian lighting brand Bocci is showing innovative lighting at the fair, including a pendant made using stretched lengths of glass. Tom Dixon is also unveiling new lighting collections, and the recently established Child Studio is showing a series of globe-shaped lamps that perch precariously on wooden bases.